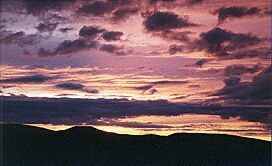 Alaska Mining News, Visitor Information, and Community. the Blue Ribbon Mine, located at the end of the Petersville Road. Hello, I'm Dennis Garrett. I came to Alaska many years ago to find adventure, opportunity and gold. I've put up this page, which started out as a "Driveguide for the Petersville Road and South Side Denali", to help guide you around the area if this is your first visit, or open up some "new" areas you may not be familiar with even if you are an 'old-timer'. 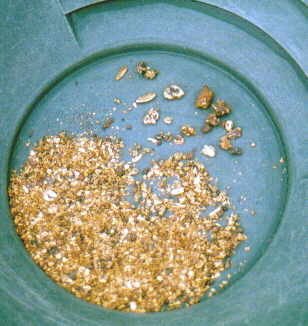 My family and I have been operating a gold mine here in the foothills of the Alaska Range since 1992. I'll try to cover the basics such as what to wear, what to bring, where to stay, and whatever else I can think of. To learn more about the region where our mine is located, as well as information and links on the history, other recreational opportunities, and to see more photos, go to The Alaska Freegold Co. or email me. 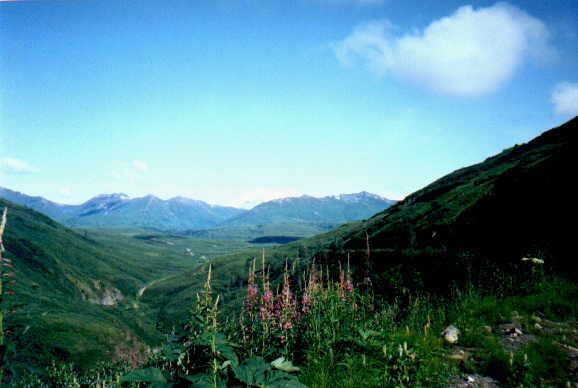 Petersville Road is the "other" road to Denali, the southern gateway to Denali, certainly the road less traveled. It's a rugged mining road, designed for true explorers of Alaska who want to discover the backcountry on their own terms. This trip will take about 1-2 hours one-way, (if you are driving) covering about 34 miles one-way. I recommend that you have a 4-wheel drive sports utility vehicle, at least after the abandoned mining camp of Petersville, but it is not mandatory. The road conditions are usually favorable for travel between July 1 and August 31, while June and September are "iffy." Due to the area's proximity to the Alaska Range, there is usually a great deal of snow on the road beyond Mile 14 the rest of the year. (That explains the area's popularity with snowmachiners who flock to the area throughout the winter.) The road is unpaved except for the first 6 miles, and the further along you travel the greater degree of 'adventure', as I like to call it, will you encounter. You should also travel with necessary survival equipment, including a spare tire, tow rope, raingear, wading boots, mosquito repellant, matches, food, water, blankets and other gear. I'm working on a list from which you can pick and choose, or ignore the whole thing. A cell phone, CB radio, or other communication device would also be handy, although most times there are sufficient vehicles passing along the road so that you would not be stuck for long. More "General Information" is found at the bottom of this page. Feel free to print this page if you like. Trapper Creek Inn & General Store is located at Mile 114.8 Parks Highway. Further up the road, Mary's McKinley View Lodge is also available at Mile 134.5 Parks Highway. Lodging on Petersville Road includes Trapper Creek B & B (Mi. .03), Denali View Chalets (Mi. 2), North Country B & B (Mi. 2.7), Gate Creek Cabins (Mi. 10.5), McKinley Foothills B & B/Cabins (Mi. 17.2). Most of these places have a beautiful view of Mt. McKinley (Denali). If you prefer, you can camp in any of the numerous pullouts along the side of the road and nearly anywhere you want beyond Mile 19, where there is almost no private property, and of course on the claims. See the map for some scenic campsites. And be sure to check with the State Division of Forestry for information regarding campfires. It may also be permitted to camp in Denali State Park or Denali National park, but you'll have to determine that for yourself. If you park your vehicle so that it blocks someones driveway or the road expect it to be gone when you return. The Alaska State Troopers will tow it away for you. NOW LET'S GO . . . FOR THE GOLD! To begin your road safari to gold country, travel the George Parks Highway to Milepost 114.9 where the community of Trapper Creek is located. If you don't have a full tank of gas, you can fill up in Trapper Creek. You can also visit Trapper Creek's Old Historic Post Office. Turn onto the Petersville Road. The first 6 miles of this road are paved. Miners built the Petersville Road in the 1920s. You will notice many farms in the area. The farms were established by the "59ers," people who came up to take advantage of a federal land grab from 1948 through the 60s and 70s. Mi. 0.7 Petersville Road: Trapper Creek's Spruce Lane Farms Museum and Gifts This is an authentic log cabin museum with a view of Mt. McKinley. Here you can get some background on the area's gold mining history and the homesteader movement. There are local gifts for sale and you can even pet the ponies before you continue your road safari. Mile 6: Moose Creek. Here you can stop and have a picnic lunch and check to see if there are any trout or grayling in the creek. Also, enjoy good berry picking towards summer's end. Mile 14: Kroto Creek -- a good place to park your vehicle and snowmachine trailer in the winter since this is where road maintenance ends in winter. Various points between Mile 6 and Mile 19 offer views of the Alaska Range and tundra lakes -- some with swans, ducks, geese, moose, etc. Mile 19: Forks Roadhouse. The remains of an old bridge can be seen on Peters Creek behind the roadhouse. There is some historic items in the Roadhouse. Take the right fork and continue on the Petersville Road. At about Mile 26, you will pass through the long-abandoned mining camp of Petersville, which was also the Post Office for the mining camps in the 20s and 30s. The historic buildings are closed and off-limits, but the rest of the lands are part of the Petersville State Recreational Mining Area. If you prefer you can just drive through and not stop, but no one has the legal right to prevent you from camping, crossing over, and otherwise recreating on the area as you wish. As you continue on, from Mile 28-30, you enter the spectacular Peters Creek canyon, a one-lane road that hugs one side of a deep gorge with waterfalls all around you. Views of the Alaska Range complete the picture. One option before entering the canyon would be to turn right onto the trail at the mouth of the canyon. You'll go up to the top of the Peters Hills. This is where I have seen some of the most phenomenal views of the Alaska Range featuring Mt. McKinley, Mt. Foraker, and Mt. Hunter. You can also see stunning views of the Chugach and Talkeetna Mountains, the Matanuska-Susita Valleys, and much more -- all set in a pristine alpine tundra. The breeze is refreshing. Surrounding you are many deep, clear lakes that were created when the ancient glaciers that sculpted this magnificent landscape sliced the top of this mountain off. Watch for migratory birds and small mammals early in the summer, and Ptarmigan and bears feeding on the berries later in the year. This is a great area to begin a mountain biking trek, as there are many rugged trails and roads in this region, and it's a great place to set up camp. Continuing on, you'll cross Peters Creek at the bridge at Mile 32 and enter the Petersville State Recreational Mining Area, an area set aside by the State of Alaska for the citizens to pan and mine for gold. If you don't know how, it's easy to learn and fun to do. This is also another outstanding area to camp. Just past the bridge you come to another fork: the left fork takes you to the Cache Creek area including the Blue Channel Project(see map); the right fork takes you to the Blue Ribbon Mine and Denali State Park. We'll go there first. If you do decide to head down the Cache Creek Road, we recommend that you visit the Dollar Creek Ventures of George and Delores McCullogh. They have a very nice, historic mine. Call 907.733.2628 for information and reservations, or visit them on the Web at http://www.dollarcreek.com. The road down Cache Creek is fair most years, but there is not much of a view. If you would like to purchase some claims in this area, check out this page (coming soon). Take the right fork, you'll travel a little ways beyond the bridge, where you'll come to the Peters Creek ford. Bears and salmon can often be seen here. The idea of crossing the creek with your vehicle may, at first, appear daunting. However, the creek is generally quite shallow, except where strong currents have cut deep channels into the gravel bed of the creek. Stay away from these areas. Instead, cross only where the water is rough, and only when the water is relatively shallow, say 2 to 3 feet. Don't hesitate or stop in mid-stream, just keep your momentum and move forward. After crossing the creek, you encounter yet another fork: the left takes you up Peters Creek, and the right takes you to Blue Ribbon Mine. You are also leaving the Petersville State Recreation area and entering privately held state mining claims. By law, you may freely travel through, or hunt, fish, even camp on mining claims without the owner's permission. However, remember that the gold and other minerals are the property of the claim owner, and any unauthorized removal can result in criminal charges and civil liabilities. This is also true for disturbing claim markers, corners, or vandalizing equipment and camp facilities. Please respect private property. As you continue on, the road becomes narrower, at times almost indistinct. The only evidence of a road or trail, which sometimes is swallowed up by the stream, is the occasional piece of surveyors' ribbon hanging from a branch. The seemingly impenetrable brush suddenly opens up, then as quickly, it surrounds you again. As you peer into the thick vegetation, ask yourself: Could there be a bear, moose, or other large beast-- or what other hidden treasure may be lurking in there unseen and unknown by me? At Mile 34 or so, you see a sign: Welcome to the Blue Ribbon Mine! (Unless it's very foggy you will have seen the mine long before now). To visit the mine, turn left here and drive for about 1.5 miles. Please feel free to take all the photos you want. Surprised to see a mailbox way out here? It started out as a joke, and then people started leaving messages and gifts in the box, and sometimes we would leave mail in it so that anyone leaving the mine could take it to town. Speaking of 'Town,' we call our camp here "Vicinity, Alaska." It, like the mailbox, started out as a joke, as we would always hear on the radio, "The weather today for Anchorage and Vicinity is . . . ." Heh heh. You can see for yourself why I like it here so much. Expansive vistas, lush valleys, rugged mountains, distant peaks beckoning the wanderer in all of us. Even the names carry you back to the turn of the century, when the West was truly Wild: Nugget, Gold, and Poorman Creeks. Or, Lucky, Puzzle and Ruby Gulches. If you listen, you can hear the songs of the birds and the sounds of the creeks carried on the breeze. Gold was discovered in this area in 1898, and the first known mining activities began in 1906. An estimated 200,000 ounces of gold have been produced since, mostly by small-scale and hand mining. As you can see, the overall impact has been minimal, and most of the lands have been or are being reclaimed. We exercise the utmost care and concern for the natural environment when harvesting the minerals we all need and use every day. You'll see how we have constructed wetlands and planted grasses and other plants to stabilize areas previously mined and abandoned long ago. We continue to research methods of reclamation and revegetation. From "Vicinity," you can depart for Denali State Park, Denali National Park and Preserve, or just hang around and enjoy the scenery. To drive to the boundary of Denali State Park, go back down the hill to the sign, turn left. After about one-half mile you will see that the road becomes very steep. DO NOT ATTEMPT to drive this unless you have a 4-wheel drive vehicle in good condition and are familiar with its operation. Continue on, until you reach the crest of the hill. Then turn left and drive until you come to the "Denali State Park" sign. A very nice trail takes off from here, and by following it for a mile or so, you can overlook the Tokositna Valley and Glacier, the Tokosha Mountains, and of course, Denali, the "Great One." (aka Mt. 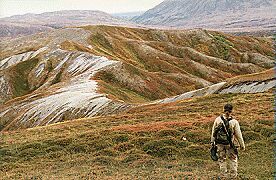 McKinley) In the 1920s, the world-renowned Alaskan artist Sydney Laurence painted from this vantage point. Captain James Cook walked and camped here while searching for a trail into the Interior of Alaska. Behind, to your left, the bodies of three men were found on 13 September 1939. All three, and the wife of one of the men, were murdered for their gold. The killer is even today unknown. Check out "The Mystery of the Cache Creek Murders" by local author Roberta Sheldon for a very through and interesting read on this subject. There is so much to see and do here, you might be asking, What's next? Well, we could go on over into Cache Creek, or to Bear Creek. But, let's save that for another day. How about some tidbits of Geology? All the terrain you see today was created in the last 9,500 years or so. By rivers of ice, mostly. The Peters Hills, named after Henry Peters, one of the first prospectors in the area, as well as the Dutch Hills, are made of slate and other sedimentary rocks dating back to the late Jurassic and early Cretaceous Periods, about 170 to 220 million years ago. A Tertiary Age (about 65 million years old) conglomerate overlies these rocks where it hasn't been removed by erosion. Coal, bones, and some gold can be found in this formation. It is also the source of the red-brown stains you see near many streams in this area. All that remains of three great glacial epochs are the U-shaped valleys, the large areas of wetlands that are dotted with numerous small, clear lakes, and the hilly terrain characteristic of moraines. What else is there to do? Hiking, fishing, photography, mountain biking, cultural exploration, bird watching, and wildlife and mountain viewing. You will be moved, inspired, and exhilarated. Only by visiting here will you be able to feel and experience the powerful connection with nature. Mere superlatives cannot describe, any more than even the very best photos, the grandeur of the foothills of the Alaska Range. In order to preserve the natural environment as well as the quality of the experience, we ask that you try to minimize the impact of your visit. After all, what's the sense in trampling and overcrowding the very wilderness you've come to enjoy? Wherever you may be, please respect the environment. Don't litter. Pick up any litter you do find and pack it out. Don't take anything out you didn't bring in. And don't leave anything behind. As you begin your return journey to civilization, consider visiting the other historic gold mining areas of the Matanuska-Susitna Valleys, for example Independence Mine, located in Hatcher Pass. Bugs, Bears, and Hiking: The best places to hike are the areas higher on the flanks of the Peters and Dutch Hills, which are free of the dense scrub growths of willow and alder. These are the areas with the least amount of bugs due to the steady breeze. In areas where there is a clear trail, please stay on the trail to minimize impact. Alpine areas are relatively fragile and slow growing. The large dug-up areas you see pockmarking the hillsides are the work of Grizzly bears digging up ground squirrels for food. To avoid conflicts with bears, make lots of noise when traveling through the thick brush, along streams, around berry bushes, and anywhere you see bear tracks or droppings. Take precautions with your food: don't store or discard food near your camp. Chances are, you will never even see a bear out here, but rest assured, they see you. Topographic Maps:U.S.G.S. Talkeetna C-2 is the main map, those adjoining it will provide excellent coverage. Weather: The weather is subject to change rapidly due to our closeness to Denali. You could wake up to a clear, cloudless day, and temperatures could soar into the 70's, or the wind could shift, and the temperature can drop 30 degrees in a few minutes, followed by a cold, windy rain. If you expect to be more that a couple of hours away from your vehicle or camp, you would be well advised to take along a day pack with a light rain jacket or poncho, among other items. Licenses and Permits- Check with various State and Federal agencies for information relating to fishing, hunting, and land use requirements. I don�t want you to get in trouble while on your safari. Visit Curry Ridge for more info as well. The local channel for CB radios is channel 19. Most cell phones work, but are better at the higher elevations. 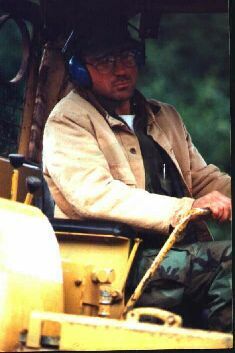 © Copyright 1998, The Alaska Freegold Company.